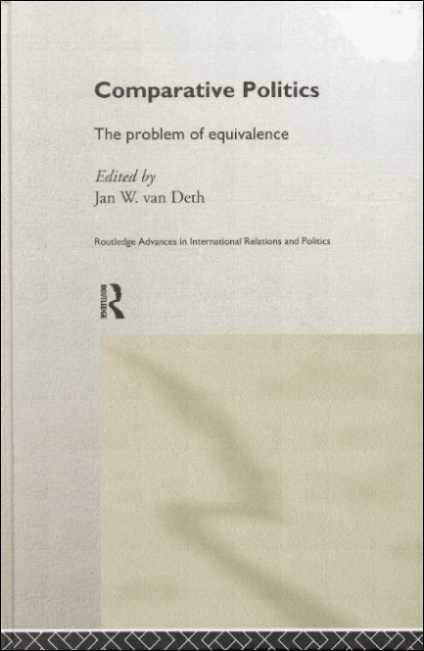 The problem of establishing equivalence in order to compare the same concepts or phenomena in different settings is common for researchers in comparative politics. Despite the importance of the problem there are few strategies to deal effectively with it. Comparative Politics tackles the issues involved and explores strategies to deal with many of the problems of establishing equivalence. Each contribution focuses on a theoretically relevant theme, such as tolerance, political values, religious orientations, gender roles, voluntary associations, party organisations, party positions, democratic regimes, and the mass media. Each chapter covers different topics, methods, data or countries, making use of previously unpublished empirical research to show the problems of finding similar or identical indicators in realistic research settings. This useful study reveals the potential for pragmatic solutions to the problems of establishing equivalence. Many ot the strategies used show how the complicated search for equivalence can unearth substantial additional information which can enhance the quality and reliability of any research. Michael Braun (1956) is Senior Project Director and was formerly Director of the German General Social Survey (ALLBUS) at the Centre for Survey Research and Methodology (ZUMA) in Mannheim. He received his doctorate from the University of Munich in 1985. He is mainly interested in rational choice theory and research methodology, and has worked especially on international comparative research in the fields of inequality, work orientations, and the family. Martin Feldkircher (1968) is Researcher at the Mannheim Centre for European Social Research in a comparative project on the change of intermediary organisations and value orientations in political subcultures. He has published articles in Blickpunkt Gesellschaft 3 (Westdeutscher Verlag 1994) and Soziale Ungleichheit (Leske + Budrich 1997). His main research focus is on social change, especially on value orientations and their change. Ronald Inglehart is a Professor of Political Science and a Program Director in the Institute for Social Research at the University of Michigan. He helped found the Eurobarometer surveys, and is coordinator of the World Values Surveys. Author of more than 100 publications, his latest book is Modernization and Postmodernization: Cultural, Economic, and Political Change in 43 Societies (Princeton 1997). André Kaiser (1960) is Assistant Professor at the Faculty of Social Sciences of the University of Mannheim. He is author of Staatshandeln ohne Staatsverständnis. Die Entwicklung des Politikfeldes Arbeitsbeziehungen in Grossbritannien 1965-1990 (Brockmeyer 1995) and editor of Regieren in Westminster-Demokratien (Nomos 1997, forthcoming). He has published widely on several aspects of British politics. His current research interest is institutional adaptation and reform in established democracies. Frauke Kreuter (1971) was Researcher at the Mannheim Centre for European Social Research in a project on social participation and is now at the Faculty of Political and Administrative Science of the University of Konstanz. Thomas Poguntke (1959) is Research Fellow at the Mannheim Centre for European Social Research of the University of Mannheim. He is author of Alternative Politics: The German Green Party (Edinburgh University Press 1993) and co-editor of New Politics (Dartmouth 1995) and The Politics of Anti-Party Sentiment (special issue of the European Journal of Political Research 1996) and has published articles in Political Studies, West European Politics, European Journal of Political Research, Zeitschrift für Parlamentsfragen, Environmental Politics and German Politics. He has been part of the 12-nation research group on organisational change and adaptation of political parties. His main research interests are new politics, party system change, and political parties. Rüdiger Schmitt-Beck (1956) is an Assistant Professor at the Faculty of Social Sciences of the University of Mannheim. His main research interests are political communication, electoral behaviour, political value change, social movements, and political participation. He is author of Die Friedensbewegung in der Bundesrepublik Deutschland (Westdeutscher Verlag 1990), and has published articles in edited volumes and in national as well as international journals such as European Journal of Political Research, German Politics, International Journal of Public Opinion Research, and European Journal of Communication. Gábor Tóka (1962) is an Assistant Professor at the Political Science Department of the Central European University, Budapest, Hungary. He is editor of The 1990 Hungarian Elections to the National Assembly (Sigma 1995), and has published articles in the European Sociological Review, the Czech Sociologicky casopis and Politologická revue, the Polish Sisyphus, and the Hungarian Politikatudományi Szemle. His works on electoral behaviour, political parties, and democratic consolidation appear mostly in edited volumes like Consolidating the Third Wave Democracies: Themes and Perspectives (John Hopkins University Press 1997), Stabilising Fragile Democracies (Routledge 1996), and Citizens and the State (Oxford University Press 1995). Jan W. van Deth (1950) is Professor of Political Science and International Comparative Social Research at the University of Mannheim and Head of Research Department II of the Mannheim Centre for European Social Research. He is author of a number of articles and books, and recently editor of Private Groups and Public Life (Routledge 1997) and The Impact of Values (with Elinor Scarbrough, Oxford University Press 1995). His main research areas are political culture, social change, and comparative research methods. He is a Corresponding Member of the Royal Netherlands Academy of Arts and Sciences and Book Series Editor of the European Political Science Series of the European Consortium for Political Research. Bettina Westle (1956) is Associate Professor at the Faculty of Sociology at the University of Bielefeld. She is author of Kollektive Identität der Deutschen (Leske + Budrich 1997), and has published articles on political support and on attitude research. Her main research areas are political sociology and political culture.